Wooden board construction with printed laminated design. Mirror on inside lid. Clockwork wound from the back, open the lid & the dragon figure revolves as music plays. 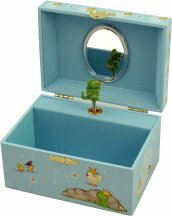 A wonderful music box perfect for boys. The little brave knight on his trusty steed is ready to fight (well, play with actually !) the dragon. 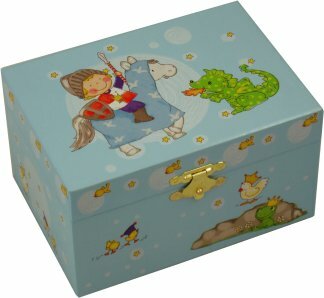 Open the lid to hear the music box play and watch the little dragon figure twirl. Blue velvet lined compartment with mirror.